“How did you receive your award?” Garcia asks the child. “My friends shared their books with me,” she responds. “When I accepted the role of assistant principal, I knew the importance of positively interacting with our students,” said Gutgsell. “Not only do students visit my office when they’ve made poor choices, but they also visit my office to celebrate those times that they demonstrate virtue in the classroom. And how better to celebrate than with a happy dance,” she adds with a smile and joyful laugh. “Ready?” Gutgsell asks the little girl. The girl shyly dances as Garcia and Gutgsell rhythmically sing, “woo-woo” and move to the beat themselves. Then they both clap and congratulate the girl. “Remember to take that certificate home to your parents,” Gutgsell calls out as the student leaves the office. Gutgsell said when she started working as the assistant principal at the Wichita Falls school in July 2018, her biggest project was to revamp the school behavior plan to make sure it was consistent across the grade levels, and not only address poor behavior, but praise and encourage the virtuous type as well. 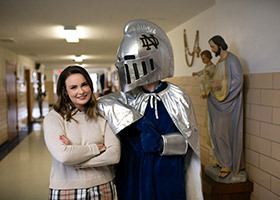 To bring that to life for the students, the school’s mascot, the Notre Dame Knight, is referenced “as frequently as possible when discussing students’ behavior.” Teachers are also encouraged to write two positive office referrals per week called Knightly Recognition Awards, just like the one the little girl received for speaking kind words about her friends. “Hopefully, every child will receive multiple awards by the end of the year,” Gutgsell said. First Grade Teacher Amanda Taylor said her favorite aspect of how the knight is incorporated into their behavior plan is the school’s new “call to attention,” which Gutgsell initiated this school year. “The teacher says, ‘Notre Dame Knights,’ and the students say, ‘Living a virtuous life,’” Taylor explained. Gutgsell, who attended Catholic schools from elementary to high school in Colorado, said being able to talk to children about virtues, or “a holy habit that imitates God” as she always explains them, and being able to pray with them is what brought her back to a Catholic school. She started as a kindergarten teacher at Notre Dame in Fall 2016. The assistant principal recalled, “I previously taught at two Title 1 schools [schools that receive financial assistance because of high numbers of low-income families], and they presented many challenges. One of the greatest challenges was student discipline. “I’ll never forget one very difficult day I experienced with a student. A student of mine was struggling a great deal, and all I wanted to do was pray with her. I certainly prayed for her, but I was unable to pray with her. This was a moment of recollection for me, and I soon realized my desire to return to Catholic education. “Since coming to Notre Dame, I pray with students all the time! When a student visits my office due to a poor choice they’ve made, we discuss the virtue they need to grow in and we end the conversation in prayer. Praying with our students is one of the most beautiful things we do at a Catholic school,” Gutgsell said. Gutgsell has a Bachelor of Arts degree in Interdisciplinary Studies from the University of Northern Colorado and her Colorado Teaching Certificate for kindergarten through sixth grade with an emphasis on language arts. “God called me to the vocation of teaching very early in life. Since the time I was six years old and teaching my stuffed bears, I knew that I wanted to become an educator,” she said. Gutgsell graduated from Midwestern State University in December 2018 with her M.Ed. in Educational Leadership and received her Texas Principal Certificate. Growing up in Parker, Colorado, Gutgsell attributes her success to her upbringing by devout Catholic parents who saw the value of providing her with a Catholic education. Elizabeth Futch, in her first year at Notre Dame as the third-grade teacher, said Gutgsell truly wants the best for her colleagues and the students of the school. “She is consistently smiling, loving, and present for our kids, which makes her a great role model for our students. She embodies the virtues that we teach every week,” she said. Futch and Taylor both participate in the other project Gutgsell worked on during the summer, the Notre Dame Mentor/Mentee Program. 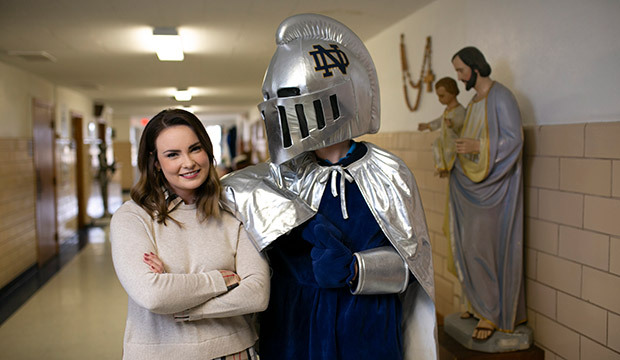 Gutgsell said that when she was a new teacher at Notre Dame three years ago, she felt she would have benefitted from a program that helps new teachers to not only become familiar with the school, policies, and procedures but also the rich history of Notre Dame along with its customs and traditions. Through the mentoring program, teachers new to Notre Dame meet once monthly with Gutgsell and other teachers who are familiar with the school’s campus and are ready to give support. “We hope to increase our teacher retention over the years by setting them up for success,” Gutgsell said. Notre Dame Principal Michael Edghill called Gutgsell a talented educator and a great asset to the school.